One of the interesting challenges you run into as a game developer is how to simply and clearly describe your game to people who encounter it for the first time. The 10-second hook, or the “elevator pitch.” Sum it up in one sentence. What is your game? Gone Home is a simulation of exploring an abandoned house to discover the story of the people who lived there. Like any elevator pitch, your one-sentence description should get people asking more questions. What I’d like do here is answer the question “what does ‘simulation’ mean in Gone Home?” Because the answer to that question drives our entire design philosophy behind the game. 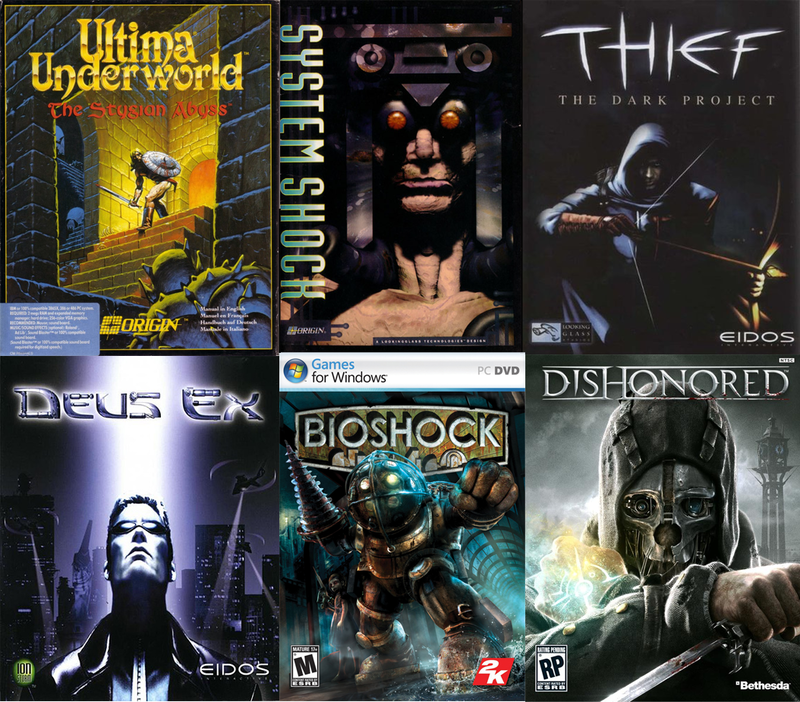 Mechanically, our biggest video game inspirations come from the subgenre of “Immersive Simulations”: Ultima Underworld, System Shock, Thief, Deus Ex, BioShock, the upcoming Dishonored. These are first-person games that emphasize believable gameworlds and player-driven experience. Explore how you want, develop the playstyle you want, inhabit a world that functions in convincing, internally-consistent ways. Immerse yourself in the experience as if you “really are” the character in the game. These games also all center around combat (or, often, avoiding combat.) Many of the interesting systems and player choices come from how you interact with enemies, and how you customize your own abilities to do so. But there are no enemies in Gone Home; there are no other people at all. So how does the philosophy of Immersive Simulation apply to a game with no combat? Can a “non-violent Immersive Sim” even exist? For us, it comes down to extracting the specific definition of “simulation” as it applies to the games that inspire us, and applying that to the context of experience we’re presenting in Gone Home. Because “simulation” in our case is not a literal term. It’s not virtual reality or the Holodeck (or even Jurassic Park Trespasser.) What it means is allowing the player to do whatever their character might logically do within the game’s context, and ensuring that the gameworld reacts in the way you expect. The design challenges in pursuit of this goal involve deciding what to abstract away from literal simulation, and how best to accomplish it. This all starts from considering the role of the player character. In Gone Home you are a normal person in an abandoned house, trying to figure out what happened to the people who lived there. So what might you want to do in pursuit of that goal? Walk through the house, open doors and drawers and closets and cabinets. Read things. Pick up objects and examine them for clues. Interesting design questions start to arise at this point. For instance, you want to be able to “read things,” but in the context of the game, what things do we make “readable”? A single-family home tends to contain hundreds of books. Allowing the player to literally read every single one of them would be bad both player-experientially, raising the text noise-to-signal ratio way above acceptable levels, and production-wise, as implementing and maintaining thousands of pages of text just wouldn’t be practical for us. This is where the idea of abstraction via consistent visual language comes into play. 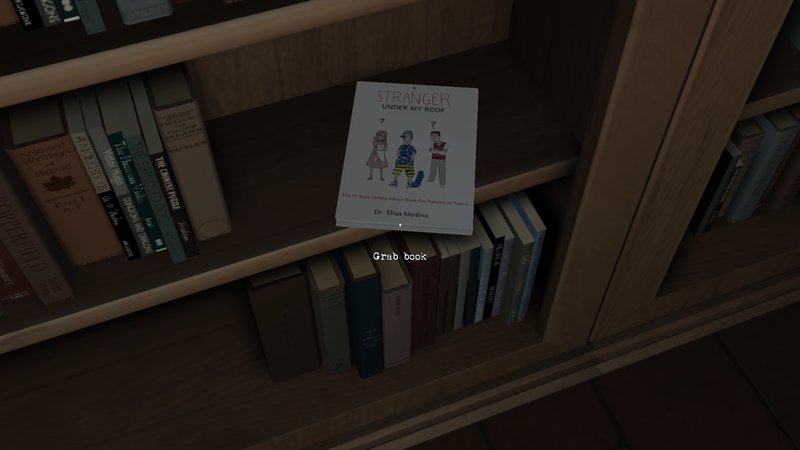 In Gone Home, you can pick up and examine any book that is lying out on its own, and cannot interact with any book that is jammed into the lineup of a bookshelf. Quickly an implicit contract is established: any book you see lying out on its own will be relevant to the story and characters, and will be interactable; anything stuffed into a bookshelf will not be interactable, but also will not be relevant to uncovering the mystery of the house. Abstraction occupies the space where the rules of the game deviate from the rules of the real world; abstracted rules must always be clear and consistent, and help the player to more fluidly inhabit the role of the character they’re playing. The question of how the player interacts with physics objects gets a little more interesting, and a little more challenging from a systems standpoint. It starts with a similar type of filtering as the book problem: if you’re an explorer trying to figure out what happened in this house, your character wouldn’t need to rearrange the furniture or topple bookshelves. But she might want to pick up smaller objects on tabletops or inside cabinets to look for evidence underneath them, or to pick up specific objects to examine them more closely. To support this player role, we implemented the Physics Examine and Put Back systems. The Physics Examine system allows the player to grab any small physical object in the game and rotate it to look at it from different angles. This keeps the idea of “examining objects” within the same interactive mode as walking around exploring the house, and puts all physics objects on a level interactive playing field; you can examine a totally mundane pencil the same way you’d examine a matchbook with a portentous note scrawled on it. You don’t get to look at only specific physics objects in high detail “because the designer says so”; you can closely examine any physical object that YOU suspect might be relevant to your experience. This only got us halfway there, though. What happens when you want to put the object down? At first we only had a system where you toss the object back at the world, turning you into a clumsy vandal by default. Which felt really bad and dumb. The player character in Gone Home might want to pick something up, look at it, then put it back down carefully. But we also wouldn’t want to restrict the player to ONLY be able to pick up objects and put them back where they came from. If the player WANTS to toss stuff everywhere, by all means they should be able to. But it shouldn’t be the only option. Our initial ideas for design solutions were way too complicated and impractical, entailing a system that would allow the player to place any physics object precisely on any surface, arranging arbitrary objects just so, dynamically detecting valid placements and rotations in realtime, etc. Eventually we realized that this wasn’t supporting the role of the player as investigator, but our own desires as blue sky designers of a literal simulation, which is not what Gone Home is about. Instead we implemented the Put Back system, whereby any object that has been placed intentionally before your arrival (anything from a desktop picture frame to a bottle of handsoap) can be “put back” in its original location by pointing at its original spot and clicking to place the object. If you look anywhere else while holding the object, you toss it into the world. So if you want to put back everything you find right where you found it, you’re free to; if you want to grab all the mugs and books and photo frames that are placed around the house and pile them up in a corner, you can do that too. But YOU’ve made that decision, and have the freedom to do so with any object you pick up. We’ve provided authored possibilities to the player, to support inhabiting the role of the player character, but we do not dictate that the player must comply with them. The difference between Gone Home and its inspirations is what role you inhabit: not a gene-spliced assassin or cyborg superagent, but a normal person in an unfantastical, everyday locale. Gone Home is an invitation. Come to this simulated place, explore as much or as little as you want, get as much out of it as you put in. “Playing how you want to” can mean more than choosing to sneak past a guard instead of killing him, or upgrading run speed instead of jump height. It can mean inhabiting a familiar, virtual place “the way you really would if you were there,” engaging with the experience how you want to, if you want to, immersing yourself as deeply as you choose into this particular slice of interactive experience. We only hope that we can live up to our inspirations. 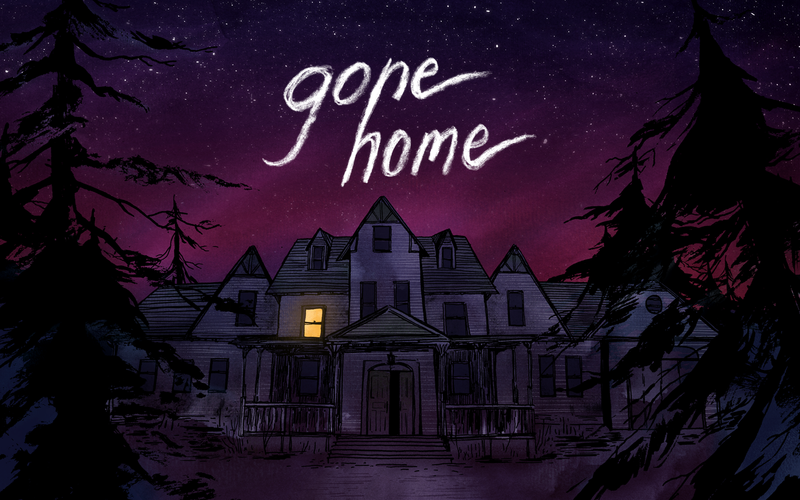 follow @GoneHomeGame or Like www.facebook.com/gonehomegame for news, updates and peeks behind the scenes of Gone Home. Great post Steve. The game is looking very interesting, I’m really intrigued by it. The exploration and having the chance of checking out even the little things like pencils reminds me of Shenmue. I recall exploring the house of Hazuki for an hour just opening drawers and checking behind paintings for hidden things like cassettes to hear in my walkman. I loved interacting with everything, it made the world seem so alive. Was this aspect of Shenmue an inspiration for the team? P.S: If you ever need someone to test the game just let me know 😉 I would be delighted to try it. I did really enjoy the parts of Shenmue you mention. That feeling of really deeply exploring an everyday environment is super satisfying for some reason, and not something that many games spend a ton of time on. Shenmue was definitely an inspiration. This now sounds even more amazing! I’m glad that as developers you guys know what you want and that your aren’t following the mold of genres similar to this. On that note, I honestly can’t think of a game that would qualify as a non violent immersive sim. I mean Dear Esther in a sense is like that because of immersing the player straight into the story and your on the island thats it, but the player is on a rail and cant make any decisions. This team is clearly passionate about getting all of their ideas in while still paying an immense amount attention to who and how someone is going to be experiencing this game. That’s why I honestly can’t wait for this game! You guys are taking time on getting it how you want and I eagerly await the results! So it sounds like there is no “complete/win” result possible, is that correct? I explore the house, come to my own conclusions, maybe piece together a story, then… stop playing/continue playing? There will be progression, and an “ending.” As you move through the house you unlock more parts of it that weren’t accessible at the beginning, and the story you discover does have a beginning, middle and end. So when you unlock all of the house and get to the end of the story, there will be an “end sequence,” but we’re not yet sure what exact form it will take, or if we’ll toss you out of the game at that point, or just let you keep exploring. Nice, probably good to have somewhat of an ending to wrap things up and let the player know its over. Nice description Steve. My own game is attempting to be another non-combat oriented immersive sim, but I’m taking a different tack in that my mechanics are about exploration, construction and trade. I find the biggest challenge is in how to let players understand the abstractions I inevitably have to make for actions that would be too complex for them or for the game tech to do. Things like how to get them to understand that connecting a battery to a turbine stores energy, how that relates to what happens in the environment etc. I find that almost all of my time is spent thinking about how different presentations would be understood by players and how to improve those representations to make them feel more natural in the simulated world. I just wanted to say I’m super stoked that you set your game in 1995…1995 being the best, most neutral, kind of “normal” year I’ve lived through. I always wanted to play an MMO set in 1995, but this will also suffice. =P Good choices, Mr. Fullbright. Glad to hear you’re into it! All of us share that feeling you do about the mid-90s: familiar enough to feel real, but long enough ago to feel like a different time and place… a good era to revisit. Just wanted to say that I’m starting to love the game. It is superbly atmospheric, it reminds me of Amnesia and that can only be good. I wish you the best with your intentions. RPS led me here too. I think PC gaming needs more non-violent games. Or at least more games that give you real choice, that let you decide if you want to find a violent or diplomatic path. That’s what I hated about Skyrim. It’s not a real RPG. It’s a hiking and killing simulator. 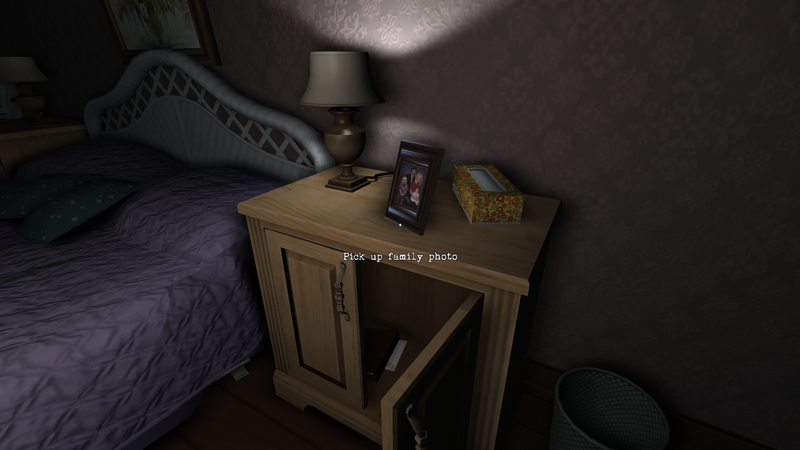 Back to Gone Home, I like the idea of having a game where you can search the story, through interactivity. It’s also a great way to be able to tell a story, not with cut-scenes or even with dialogue, but with what games have that other media don’t: interactivity. Be able to search the place and look at the objects to find out clues about what’s going on. Like a more advanced, less restricted, non violent L.A. Noire crime scene investigation. I also like the fact that they are innovating, thinking about new ways to convey the story and interactivity in a game. Hopefully it’ll be at least something refreshing and interesting. Really, violence is fun (in games, not in real life), but now it’s damaging and limiting all the amazing possibilities games have as storytelling devices, as artistic expression and as fun media. Adventure games have been good for telling different stories, but I think all genres could benefit from reducing gore and action and making a more balanced experience. Grim Fandango is a great cinematic experience that had humour, action, drama, suspense, etc, etc, etc. And a bit of violence, surely. Why must all games be shooting and fighting all the time? Non-violent games are the way the future of gaming should go. Portal is a great example of a game with minimun violence, great storytelling and gameplay and very fun. How many non-violent games can you think of? Well, I wish you the best luck in the development of this interesting game. It seems like a breath of fresh air. I’m really looking forward to it. Really, genuinely pleased you’ve addressed low level interface issues, even though I know, for sure, that’s a lot of work, and that many would consider it a sideshow. I personally think it’s completely worth the effort, and a dereliction of duty not to address it. I think that the slightly higher level concepts you want to address are ill served if there’s not that foundation layer which makes the world feel “sensible”. Although it all comes down to base level UX and interface, you’ve got yourself a foundation, now, where you don’t have to worry that the core interactions fight the message of the game by being pure ransack ’em up. Good job, gang. Keep it going! I am searching for immersive PC games With less violence and more adventure and/or exploration. Destruction/Conquest is not the only excitement genre. What I easily imagine with no effort are settings in space exploration; mountain climbing; or lost with your struggle to survive in challenging environments types of games. Now given more time and effort to imagine a game scenario I am enjoying the creativity of designing a storyline that has time travel hazards where your correct time was a universal peaceful, prosperous and abundant high tech existence; you must find a way to return to your correct timeline. Imagine the tease of revealing that a future of peace and abundance actually exists! Also imagine trying to escape a past that is rampant with institutional crime, corruption, deception, wars, and based on a predatory meme. Where you must not only survive but you must also not kill anyone or else you will have permanently sealed yourself in this wrong time-line! Okay, I am off to continue my search for a less violent PC game.